Can land grabs by foreign investors in developing countries feed the hungry? So says the press release for a recent, and unfortunate, economic study. It comes just as civil society and government delegates gather in Rome this week to negotiate guidelines for “responsible agricultural investment” (RAI), and as President Obama welcomes African leaders to Washington for a summit on economic development in the region. At stake in both capitals is whether the recent surge in large-scale acquisition of land in Africa and other developing regions needs to be better regulated to ensure that agricultural investment contributes to food security rather than eroding it by displacing small-scale farmers. This is the first part of a two-part series on the reasons for the sluggish U.S. economic “recovery” since the Great Recession, by Gerald Friedman, professor of economics at the University of Massachusetts and author of Microeconomics: Individual Choice in Communities. Originally published in Dollars & Sense, this post focuses on the basic shape of the recovery—wage stagnation, increased profits, and growing inequality. The second part will focus on the reasons for the persistent weakness in demand and economic growth, and the failings of various government policy responses. The 2007-2010 recession was the longest and deepest since World War II. The subsequent recovery has been the weakest in the postwar period. While total employment has finally returned to its pre-recession level, millions remain out of work and annual output (GDP) is almost a trillion dollars below the economy’s “full-employment” capacity. This column explains how high levels of unemployment have held down wages, contributing to soaring corporate profits and a remarkable run-up in the stock market. There was a sharp fall in output (GDP) at the onset of the Great Recession, down to 8% below what the economy could produce if labor and other resources were employed at normal levels (“full employment” capacity). 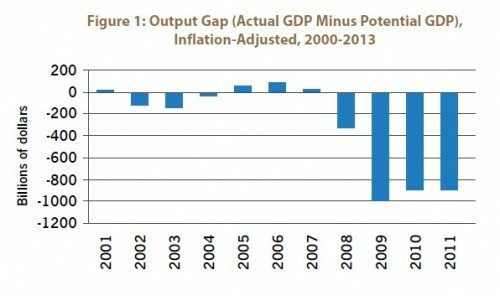 Since the recovery began, output has grown at barely above the rate of growth in capacity, leaving the “output gap” at more than 6% of the economy’s potential—or nearly $1 trillion per year.